Astrophotographer Tony Prince took this image of the Milky Way on March 10, 2016 from Havasu Falls, Arizona. The electric blue sky dotted with Milky Way stars is reflected in the flowing waterfall in this stunning image. 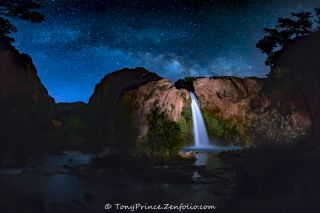 Astrophotographer Tony Prince took this image on March 10, from Havasu Falls, Arizona. March is an early time in the year to capture the Milky Way and Prince had to wait for the so-called "Blue Hour" – a time during dawn and dusk each day when residual sunlight takes on a blue hue. The Milky Way, the galaxy containing our own solar system, is a barred spiral galaxy with roughly 400 billion stars. The stars, along with gas and dust, appear like a band of light in the sky when seen from Earth. The galaxy stretches between 100,000 to 120,000 light-years in diameter. Havasu Falls is located within the Havasupai Indian Reservation in the Grand Canyon and is a popular hiking and photography destination. As early March was still the off-season, Prince and a fellow astrophotographer carried their camera equipment up 2 miles in pitch darkness. Prince used a 15mm Zeiss 2.8 Canon lens adapted to a tripod mounted Sony A7Rmarkii. The settings for this 10-shot panorama (which the photographers stitched together in Lightroom CC) ISO 6400, F2.8, 15 seconds per frame.